Recently, the Acadian Museum acquired a unique piece of history—a diary written by Corrine Broussard during an historic 1930 visit to Grand Pré by Louisiana Cajuns. Twenty-five Evangeline Girls accompanied by nine chaperones and led by Sen. Dudley J. LeBlanc Sr. embarked upon an epic journey to commemorate the 175th anniversary of the Acadian Deportation. It is believed that this was the first group of Cajuns to make the journey back to their ancestral homeland in Nova Scotia since the Acadian Deportation in 1755. Warren and Mary Perrin are editing and annotating the diary in preparation for the publication of an unusual book projected to be released in the spring of 2017. During their research, they discovered that subsequent to Senator LeBlanc's epic journey to Canada in 1930, two groups of Canadian Evangeline Girls made the trips to visit the Cajuns of Louisiana in 1931 and then later in 1946. On November 13, 2016, the Perrins went to Moncton, New Brunswick to do further research, interview participants and search for artifacts, particularly a silver loving cup presented by New Orleans' Archbishop Joseph Francis Rummel on October 11, 1946 to a Canadian Evangeline Girls choir who came to visit Louisiana. 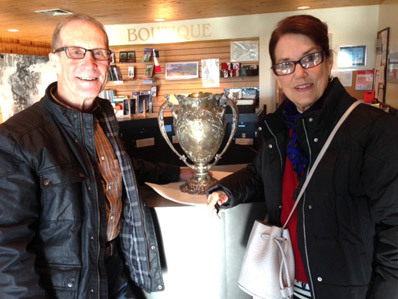 In response to the Perrins' request, Jeanne Mance Cormier, Conservator at the Acadian Museum at the University of Moncton, located the exquisite silver and gold loving cup in the museum's storage vault. The 15-member all-female choir received the cup in commemoration of their historic tour. The young women, who sang in costume, performed in 45 Louisiana towns over an 11-day period. 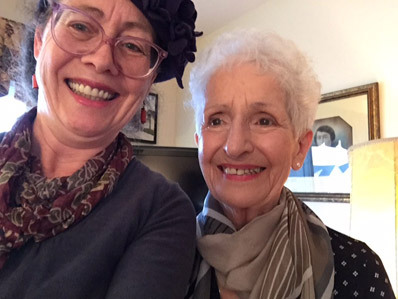 With the help of Jeannita Theriault and Viola LeBreton of Moncton, NB, the Perrins located and interviewed one of the former Evangeline Girls, Corinne Dugas-Melanson, now 92, in Moncton. It is believed that hers was the first group of Canadian Acadians to visit Louisiana. Their visit to Louisiana was facilitated by the Association of Louisiana Acadians. Importantly, these were some of the earliest and most successful reunifications between the Acadians of Canada and the Cajuns of Louisiana in the 20th century. Viola LeBreton (left) from Moncton and Corinne Dugas Melanson, are photographed in Dieppe, New Brunswick, Canada on November 14, 2016.